The Wolfsonian Museum is teaming up with local farms and makers of food products for this all-about-the-local-food-you eat event. 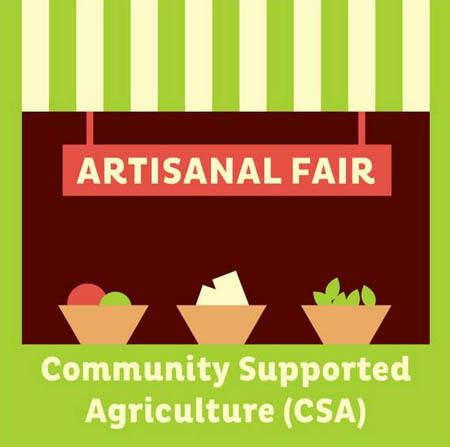 Artisanal Fair @ The Wolf and CSA Sign-Up is a fantastic opportunity to meet your local farmers. Come find out more about local food grown by Margie Pikarsky of Bee Heaven Farm and sign up for one of her Community Supported Agriculture (CSA) farm shares. Teena Borek from Teena’s Pride CSA and Muriel Olivares from Little River Market Garden CSA (sold out for this season!) will also be there. Buying from a CSA a great way to support a local farmer, and get fresh produce every week during our harvest season. At 2:00 pm, take a special guided tour of the current Modern Meals exhibit. It will be led by museum staff and Teena Borek. This event is co-presented by The Village Stand gourmet shop and Slow Food Miami.